While the redesigned 2009 Audi A4 doesn't necessarily break any new ground, drivers and reviewers agree that the combination of new technologies in an entry-level luxury sedan, plus its larger size, sportier exterior design, and upgraded interior make the A4 a highly competitive vehicle in its segment. Some question the A4's ride, which can sometimes feel a bit rough on bumpy roads, particularly when drivers choose the stiffer Dynamic setting on the optional Drive Select feature. 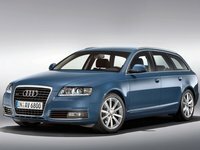 With the redesigned 2009 A4, Audi continues to set the trends in the highly competitive entry-level luxury sedan segment. Offering more interior space and cargo room than its predecessor without gaining noticeable weight, the Audi A4 packs a lot of style and technology into its shapely design. 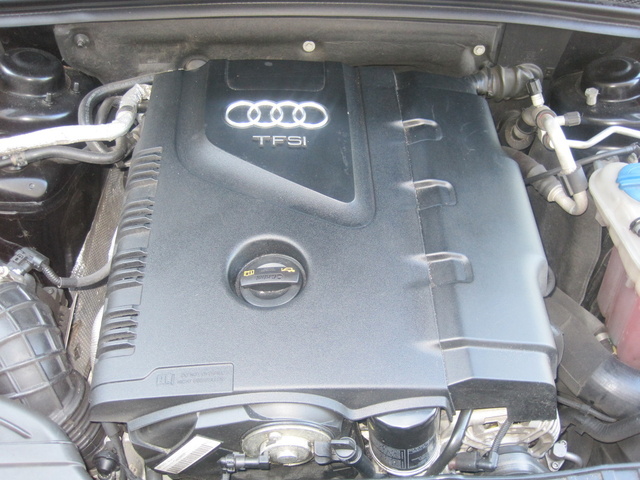 A pair of new, more fuel-efficient engines make the A4 an even more compelling purchase. 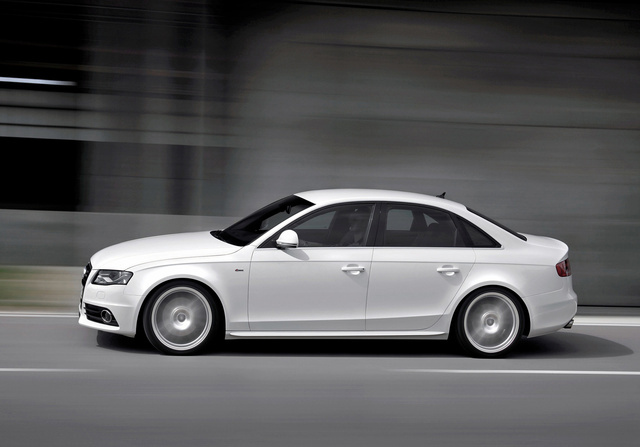 Audi has improved its 2009 A4 entry-level luxury sedans in just about every way. For starters, Audi dramatically reshaped the A4, creating a car that's not only longer (by 4.5 inches overall) and wider (by 2 inches) but slightly lower as well. As a result, the '09 Audi A4 feels more firmly planted to the ground, with a better stance and stability. In addition, thanks to the use of ultra-high-strength steel, the A4's body shell has shed unnecessary pounds by about 10 percent, although overall the A4 weighs slightly more than the vehicle it replaces. Exterior design changes include a longer hood, shortened body overhangs, and an overall sculpted yet sportier appearance. The distinctive deep-mouthed grille remains, and Audi has added LED running lights beneath the headlights. Because of its more aerodynamic shape, which results in less wind resistance, as well as improvements to engines and the air-conditioning system, the '09 A4 uses fuel more efficiently than the previous year's version. The '09 Audi A4 also comes equipped with a redesigned suspension, borrowed from the '09 Audi S5 and A5 coupes, and a revamped interior, which continues to make use of premium, class-leading materials. In addition, due to its longer wheelbase, the '09 A4 offers more interior space, especially in the rear seats, and more cargo space. The A4's redesign for 2009 applies only to sedan trims (and to the '09 A4 Avant wagon). The A4 Cabriolet trims, which received their last redesign in 2005, carry over from the previous year with the same platform, body, and engines. However, the A4 Cabriolets receive an S Line exterior package upgrade for 2009, which includes an updated grille, bumpers, and a trunklid spoiler. In addition, new standard features for the Cabriolets include Sirius satellite radio, Bluetooth hands-free phone functionality, and upgraded alloy wheels. The A4 Cabriolets continue to come equipped with a fully automatic soft-top roof, which raises and lowers at the press of a button at speeds up to 18 mph. 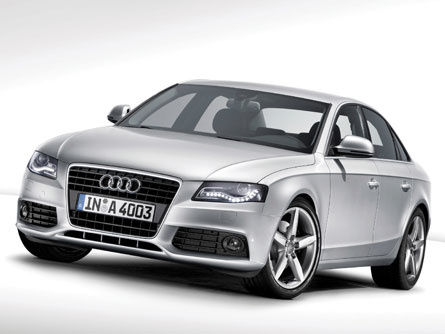 Audi offers the A4 in six trims for 2009. The 2.0T and 2.0T quattro sedans receive an all-new turbocharged 2.0-liter four-cylinder engine, which produces 211 hp, an increase of 11 hp over the previous year's four-cylinder engine. Audi designed the new engine to provide better fuel economy as well as improved torque, which maxes out at 258 lb-ft at 1,500 to 4,200 RPM. For the entry-level front-wheel-drive 2.0T sedan, the engine links to a Multitronic Continuously Variable Transmission (CVT), which adjusts shift points to ensure optimal acceleration and fuel economy. For the all-wheel-drive 2.0T quattro, the engine links to a six-speed manual transmission. Stepping up a notch, a "heavily revised" (according to Audi) 265-hp, 3.2-liter six-cylinder engine provides power for the 3.2 quattro sedan. The six-cylinder engine employs FSI direct injection and an Audi valve lift system on the intake valves, resulting in a 10 percent improvement in fuel efficiency compared to the previous-generation six-cylinder engine. The new engine links to a six-speed automatic transmission with Tiptronic, which enables drivers to manually shift gears, and works in conjunction with the quattro all-wheel-drive system. The 2009 A4 Cabriolets, including the 2.0T Cabriolet with front-wheel drive, the 2.0T Cabriolet quattro with all-wheel drive, and the 3.2 Cabriolet quattro, all retain the previous year's engines. A 200-hp, 2.0-liter inline four-cylinder engine drives the 2.0T Cabriolet and 2.0T Cabriolet quattro, while a 255-hp, 3.2-liter V6 with direct injection provides power for the 3.2 Cabriolet quattro. The updated '09 A4 sedans offer drivers a more balanced driving experience, compared to the previous year's cars, thanks to a new platform that moves the engine back by about 5 inches, so it's now located behind the front axle, providing better overall weight distribution. In addition, Audi redesigned its Servotronic steering system for a tighter, more responsive feel. Reviewers note that the A4 handles ably on even the tightest, twistiest roads, no matter if drivers opt for a front-wheel- or an all-wheel-drive trim. While the new six-cylinder engine doesn't provide the power of a V8, it doesn't feel underpowered, according to reviewers. Thanks to a more rigid body, the new A4 handles well over all types of roads, with a minimum of body roll and sway. However, some reviewers note that the ride can sometimes be a bit harsh on bumpy roads, perhaps due to the A4's tightness and rigidity. While 18-inch wheels, which come standard on A4 trims with the Prestige options package and are optional on other trims, can help smooth out the ride, they're also noisier than the standard 17-inch wheels, some reviewers note. Audi's dedication to the quality of interior materials makes the A4's cabin extremely comfortable for long trips. The sedan's longer profile results in more interior space, especially for rear-seat passengers, and the seats themselves have been redesigned for greater comfort. New optional features for the 2009 A4 include Drive Select, which enables drivers to choose from three settings that make adjustments to the engine, transmission, and suspension to provide three different driving options - Comfort, Dynamic, and Auto. The Comfort mode provides smoother shifting and a softer ride, while the Dynamic mode offers drivers a tighter, sportier feel that communicates more of the road feel. (Some drivers and reviewers do not recommend this setting over rough surfaces.) The Auto setting finds a middle ground between the two other modes. Drivers and reviewers alike agree that the quality of the A4's interior materials sets the standard for vehicles in its class, which includes the Mercedes-Benz C-Class and the BMW 3 Series. Standard features for all A4 sedans include leather upholstery, eight-way power-adjustable front seats, a multifunction four-spoke steering wheel, and textured decorative aluminum inlays in the dashboard and doors. Premium Plus and Prestige options packages add heated front seats, three-zone automatic climate control, and a driver information system that tracks fuel economy in real time, among other features. Audi redesigned the dash and center console in the A4 sedans for better ease of use. In addition, Audi repositioned the brake pedal to make it more comfortable to use. Thanks to the redesign, cargo space in the sedans expands from 13.4 to 17 cubic feet. A Multi-Media Interface (MMI) with a 6.5-inch color monitor comes standard on all A4 sedans. It displays information about the audio and air-conditioning systems. Depending on the options package, audio systems range from a 180-watt Audi Concert system to a 14-speaker Audi Symphony system with a six-disc CD changer. Standard features for the 2009 A4 Cabriolets include 12-way power-adjustable front seats, a backlit instrument cluster, and a four-spoke leather steering wheel. The 3.2 Cabriolet quattro adds heated front seats and genuine wood trim in Dark Walnut or Beige Birch as standard features. The National Highway Traffic Safety Administration awarded the redesigned 2009 A4 its five-star safety rating (the highest available) for frontal, side, and rollover crashes. The A4 sedans come equipped with a full range of airbags, including Sideguard head airbags. Other standard safety features include Audi's backguard system, which adjusts seats and headrests to protect occupants in the event the car is struck from the rear. In addition, the Cabriolets come equipped with an Active Rollover Protection system, which automatically unlocks the central locking system, switches on interior and hazard warning lights, and switches off the engine if it detects an impending crash. A4 sedans with the Prestige options package include an Audi parking system, which alerts drivers using audible tones that indicate the distance to an obstacle when parking, and Audi side assist, which monitors the driver's blind spots and notifies the driver via an LED light when a car enters one of those spots. Options include a new adaptive cruise control, which monitors the distance to the vehicle ahead and automatically reduces or increases speed to maintain a safe driver-selected distance. Most drivers and reviewers agree that the A4's refresh was a much needed one, given the competition in the entry-level luxury sedan class from both BMW and Mercedes-Benz. And most agree that the makeover results in an A4 that's even more competitive, particularly when it comes to the sedan's interior. Some question the A4's ride, particularly when drivers choose the Dynamic setting on Drive Select, but overall the 2009 Audi A4 receives high marks from drivers and reviewers. What's your take on the 2009 Audi A4? Have you driven a 2009 Audi A4? So i have a light on my dash that's a zero with a slash through it and a km/h beside it. What is it?